Because of the complexity of the mortgage market and the agreement, which will be executed over a three-year period, borrowers will not know right away if they are eligible for relief, Cummings says. Homeowners who need manageable mortgage payments should contact their bank directly to see if they qualify, Cummings suggests, since the settlement requires banks to provide up to $17 billion in principal reductions on first and second mortgages and other forms of loan modifications. 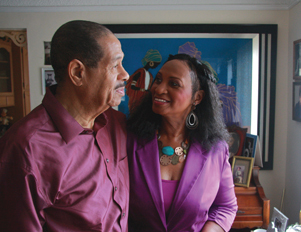 In a twisted bit of irony, former loan officer Melvina Bogan and her husband, Richard, are fighting to save their Los Angeles home. The couple, now retired, bought the property for $145,000 in 1998, making a 20% down payment, or $29,000, leaving a balance of $116,000. The property is a two-unit home; the Bogans occupy one of them. “We purchased the property thinking it would take care of itself because the back unit would generate income to make the mortgage payment,â€ says Melvina. In the wake of California’s housing bubble, the Bogans saw their property rise to as much as $670,000 in 2006. So they refinanced, taking $200,000 in cash out of their fixer-upper to renovate both units, putting in new plumbing, roofing, and electrical wiring. Both the primary mortgage and a $50,000 home equity line of credit have an adjustable rate, meaning the interest can rise or fall according to the market. The property is now worth $350,000 and the 30-year mortgage is $376,000. The Bogans have lost half the market value of their home. “When the economy took a turn for the worse, we, like so many other homeowners across the nation, began to realize that our property had gone down in value and that we were seriously underwater,â€ Melvina says. The couple now fears that their $1,658 monthly mortgage payments (including taxes and insurance), plus the $187 a month to repay the home equity line of credit, will soon become unmanageable. (Both are due to reset later this year.) Melvina agreed to the terms because she was earning a good income and was told that she could later refinance at more favorable terms. “We’re trying to keep the payments affordable. But the way it’s set up, the rate keeps adjusting and will get to the point where we can’t afford it and will lose our home,â€ Melvina says. “Sometimes I think the banks are trying to turn the U.S. into a nation of renters instead of homeowners,â€ she continues, echoing the sentiment of many who feel mortgage lenders are reluctant to work with homeowners to modify or refinance their mortgages. Early on, the couple did their homework and discovered they were eligible to participate in the Home Affordable Modification Program, or HAMP, which is designed to help struggling borrowers reduce their monthly mortgage payments. But the couple’s mortgage lender denied the modification. When the housing bubble burst during what has become known as the Great Recession, the American dream of homeownership became a nightmare for millions of African Americans. Many have experienced a disproportionately high level of foreclosure. According to a 2010 study by the Center for Responsible Lending, 4.5% of white borrowers lost their homes to foreclosure between 2007 and 2009, but black and Latino borrowers had foreclosure rates of 7.9% and 7.7%, respectively, making them more than 70% more likely to lose their homes to foreclosure during that period.